"Revenge is in God's hands." The Revenant, Birdman director Alejandro González Iñárritu's latest film starring Leonardo DiCaprio, is an unrelenting and brutal tale of revenge set in the age of frontiersmen and loosely based on Michael Punke's biographical novel about legendary fur trapper Hugh Glass. Iñárritu continues his use of filmmaking as a trick of visual form and construction instead of his earlier style of intricate and more visceral storytelling. Iñárritu can't resist the urge in overemphasizing style in order to tell an intense but otherwise standard story of survival set against the grandeur and harshness of nature. It's impossible to deny the film's scope and ambition as it was clearly hell to make. This is nowhere more obvious than in DiCaprio's ferocious, mostly wordless performance. He stretches his skill and acting talent to the absolute limits of human suffering. 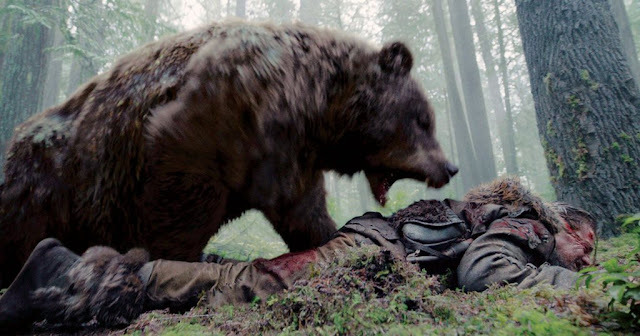 Despite his towering impression on screen against Tom Hardy, playing the antagonist who betrays him and leaves him for dead in the wild after a vicious bear attack he miraculously survives, The Revenant has an emotionally detached interior feeling when its focused firmly on the uninspired tale of vengeance over its more naturalistic survivalist themes. Domhnall Gleeson is also excellent and stoic as the captain in charge of the expedition who invests greatly in Glass' continued survival and well-being as is Will Poulter as possibly the only sympathetic character in the film. But once again, the real star is cinematographer Emmanuel Lubezki's stunning, unforgettable visuals along with his trademark long takes. Filmed at great trouble and only using natural light, the imagery and landscapes captured are beautifully rendered only further highlighting the misery in the characters while the audience revels in their constant suffering at the hands of nature's elements on screen. Like Iñárritu's recent body of work, The Revenant is parts masterful filmmaking as a revelation in overly visual storytelling techniques as he continues to put form and style over story. Despite no lack of ambition or material, the film is absolutely relentless and misses being a complete cinematic experience of visuals, characters, and narrative ever coming together fully. Like Birdman, it's more interesting for its filmmaking process than the actual final product itself. Regardless, the film still remains an impressive feat that begs to be consumed as a breathtaking piece of gruelling, hellish filmmaking and for its undeniably towering performances.